Every city beholds a secret or two, Pyongyang had some belters kept up its sleeve for our final day of sightseeing capital of the DPRK. 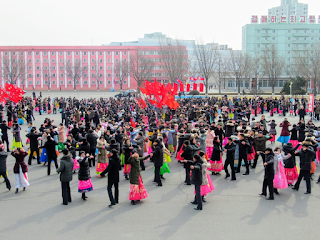 Seeing a Mass Dance was a sight for sure, going underground showed us more and a certain department gave us a closer insight to DPRK everyday life. Rewriting the book, Pyongyang had more to show us on that final day! No, Soju! 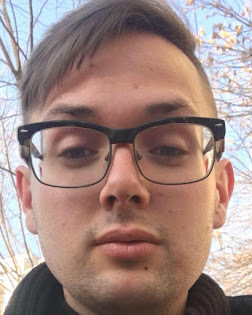 No, P-Y! Breakfast was brief, we revisited Kim Il Sung Square to find a more lively version compared with the visit after myself and the flight-takers arrived in Pyongyang. It was still quite quiet compared to South Korean standards but there was a little bit more traffic and people going about their business compared with the first time. 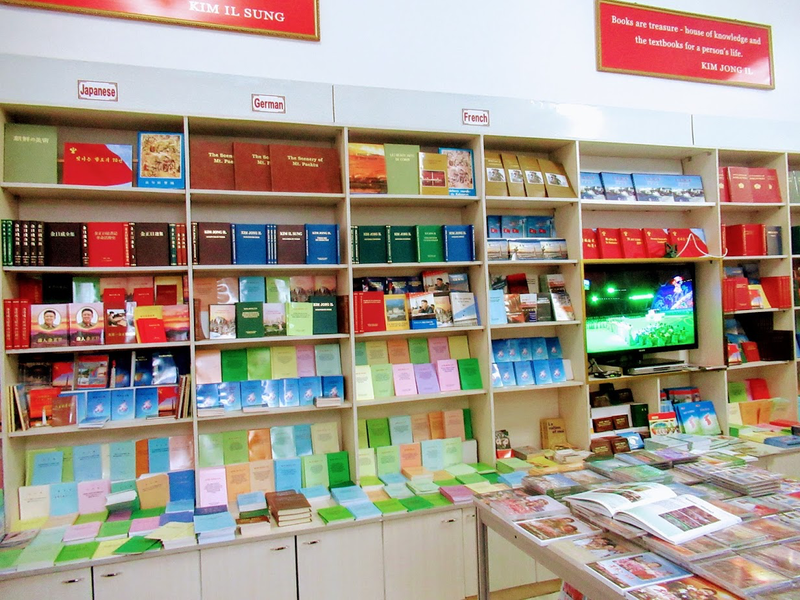 The ice cold breeze bite like crazy, finding the Pyongyang Foreign Language Bookshop was a blessing to find a spot of warmth. Yes, the previous night had been fuelled with copious amounts of drink as we stayed in the hotel once again after dark. I wasn't crazy about buying any books, posters or any kind of literature but the amount of languages that were on offer impressed me much. The other members of the tour bought what they wanted, being only a short stop it was back out into the freezing cold. Having no Internet for almost four days was something else, I had actually forgotten all about it! Oh no! The visit to the bookshop wasn't one of the highlights of the day but things would improve as the day progressed. The last official day of our Pyongyang schedule had arrived, it had been such an amazing experience with many unexpected twists and turns. I was starting to get used to Pyongyang, it didn't seem like such an alien place when I compared PY with its southern sister capital. The many bicycles hoodwinked me into thinking it was normal not to see so many cars on the streets. The Soju might not had been as fruity as the South Korean brands but we made our own palatable versions, the nightlife itself gave us a sense the all singing and all dancing waitresses played a large part in our trips evening schedule. Things weren't normal compared with our daily lives but being within that environment gave us a sense that all eyes were upon us, it wasn't ever intended to be a normal holiday. Most of all the importance to ask if photos could be taken became such a normal thing. Yes! Getting myself together still hadn't happened but the morning still had to be. Pushing through my state thrusted me back into the nail bitingly chilly temperatures outside the Fatherland Liberation War Museum. 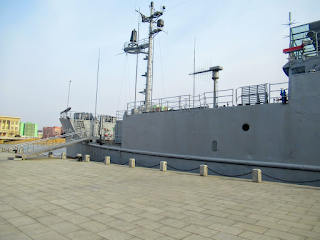 No photographs were permitted inside the museum, it was however fine to take photos of the captured United States vessel, U.S.S Pueblo and of the artillery and vehicles that were left behind since the end of the Fatherland Liberation War. I had seen on countless documentaries that the former US vessel strayed into North Korean waters on the 23rd of January 1968. Going inside the once operational boat gave us a true insight. Seeing the bullet holes on the interior walls painted a vision as to how the Pueblo was seen to be a threat to the North Koreans, well to the authorities who were managing the North Korean waters that day. I was glad to have some background information before visiting. P, just Pueblo? Inside the museum it gave us untold amounts of grandeur, adorned with opulent designs and dripping with chandeliers from the ceilings, it was one of the most lavishly decorated war museums I had ever seen before! Kim Jong Un and his ruling relatives were painted for the gods, those portraits on the walls were the centrepieces amongst the many installations that told the peril and bloodshed the opposing side inflicted onto the Korea that was then ruled by Kim Il Sung. One installation acted as moving piece of theatre with flashing lights and a revolving platform that gave us a Birdseye view over the model version of the former Korean battlefield. That museum experience wasn't like any other, the commitment to the order of events was outstanding, recounting every single movement and justification for each action. I won't ever forget that museum, no word of a lie! 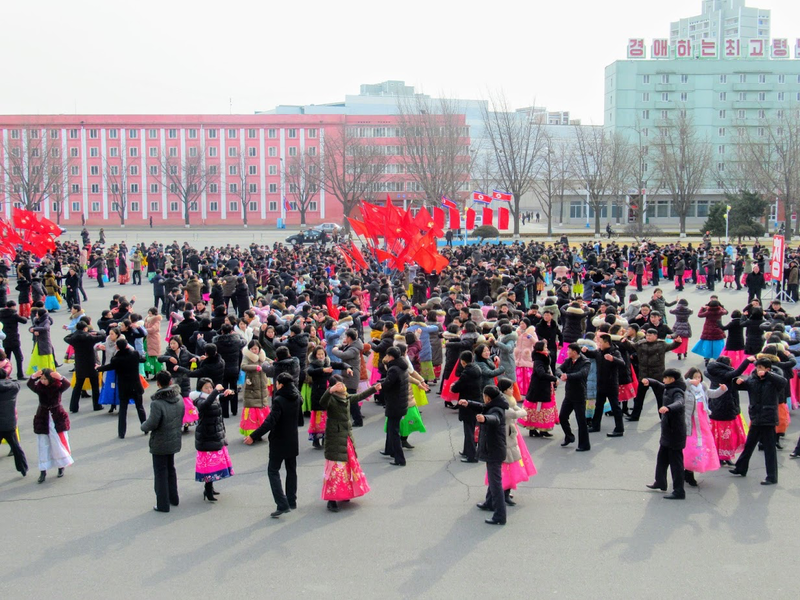 Being a holiday in the DPRK that day, we vacated the museum for a special Party Foundation Day surprise! I wasn't going to see the Mass Games but in second place I would be seeing a Mass Dance instead. Signalled to start by a voice from the stage, three hundred or so students commenced their fiercely choreographed circular dance routine in unison. Their timing was something to be proud of, no mistakes were made throughout our time that we watched the students dance. It was such a bizarre sight, being a holiday it looked like the students had prepared for this dance for sometime. I even got into the circle of dancers for a brief second, it felt so forced and the dancers were practically chained to a rhythm so I jumped back out again to rejoin the tour group. Going back to the coach was such a relief due to the freezing cold temperatures, I was looking forward to lunch because that meant being in the warm! Lunch refuelled our cold selves, it was time to visit a normal Pyongyang City middle school. I was so intrigued P! OK, let me backtrack! We stopped by the Arch of Triumph for a little look around, going to the viewpoint gave us a nice vista of the city. Next to the Arch of Triumph was a football stadium that had been featured during one of the documentaries that I had previously watched, it was pint-sized! The sports shop was strange, anyhow I got some pretty bags for my language materials. Right, let's get back to that school! After digesting the schools trophy room we were taken to one classroom, being a teacher I felt it was a normal place to be but we were literally the main attraction! The confused students had their eyes transfixed on us, some of the group got asked questions but one of the boys asked me what my job was, they genuinely looked gutted that I wasn't their teacher! I was humble about their praise! Our final day in Pyongyang was almost over but we had seen so much, I personally loved the visit to the school. Of course, I was ready to go underground on the Pyongyang Metro! Going down what seemed like the deepest and steepest escalator down to platform level of the Pyongyang Metro felt unnerving to say the very least. From the concrete streets to that platform acted as quite a contrast, the opulence of the chandeliers and the intricate paintings that brought the platform level to life amazed us. 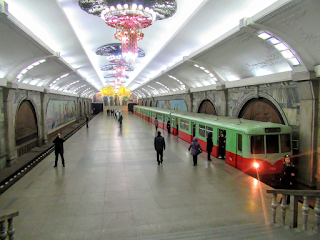 The vintage metro cars pulled into the simple yet elaborate station, no advertising was needed because the leaders had painted all the necessary eye-catching things on the platform walls. Boarding our very own compartment gave us a quieter experience compared to the other YPT experiences but if truth be told it gave the local people the chance to go about their business without cameras in their vicinity. Each carriage had their own paintings of the dear leaders, I don't think the Queen's portrait will be on the Tube anytime soon? No way! But both stations reminded me of Beijing's Line 2! Our final day in Pyongyang was almost over but we had one more place to visit before our leaving meal. Leaving our cameras behind on the coach it was our chance to experience a real Pyongyang department store! Changing our foreign currency from Chinese or American tender to the local DPRK Won was insane, it wasn't something that was accepted for foreigners to carry so it was exciting to spend it all up! 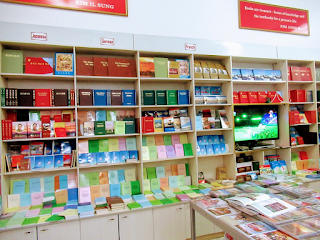 The Gwangbok District Commercial Center showed us a raw and everyday view of North Korean people in a shopping centre. Going to the food court made me feel I was in Xianning, Hubei because those local people had no clue about foreigners, they were so interesting and actually smiled back! The beer was cheap, the snacks were tasty and the supermarket downstairs was a visual treat! Enjoying our final meal had to be done before going back to the hotel for the final drink as a group! At the end of things, Pyongyang City had been utterly bizarre but amazing at the same time! Yes, P!